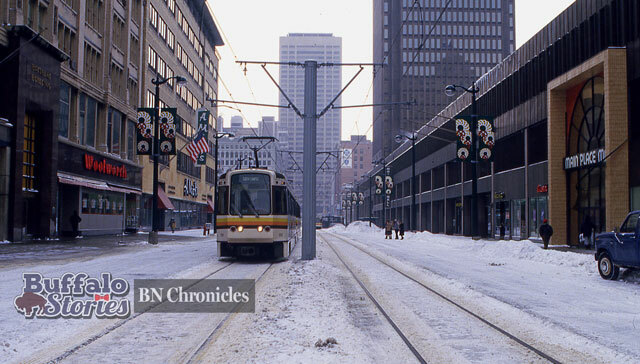 Buffalo in the 80s: Where did WNY families dine in the mid-1980s? 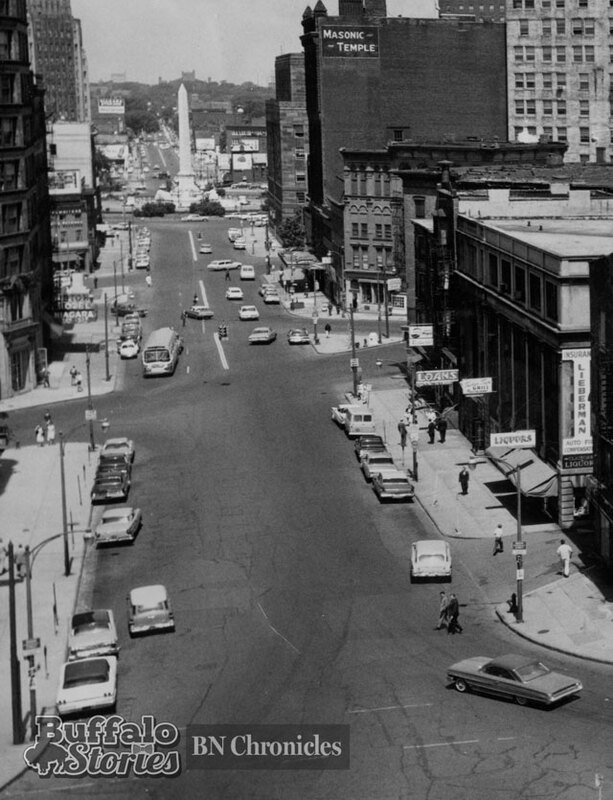 Buffalo’s children of the ’80s have memories of a list of “fine-dining” institutions that are mostly different than the family eateries of today. 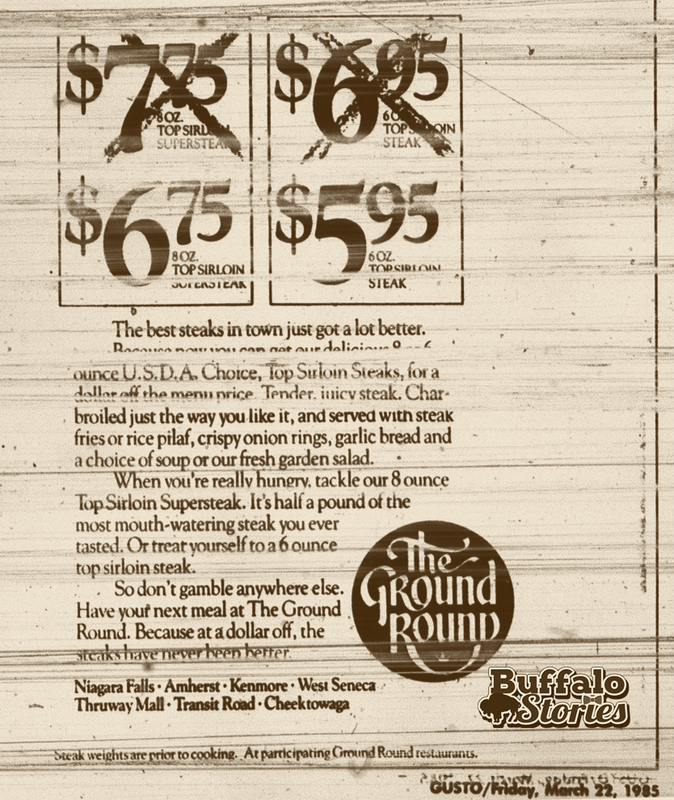 From the pages of The Buffalo News on March 30, 1985, here are some restaurants where a family might have eaten. 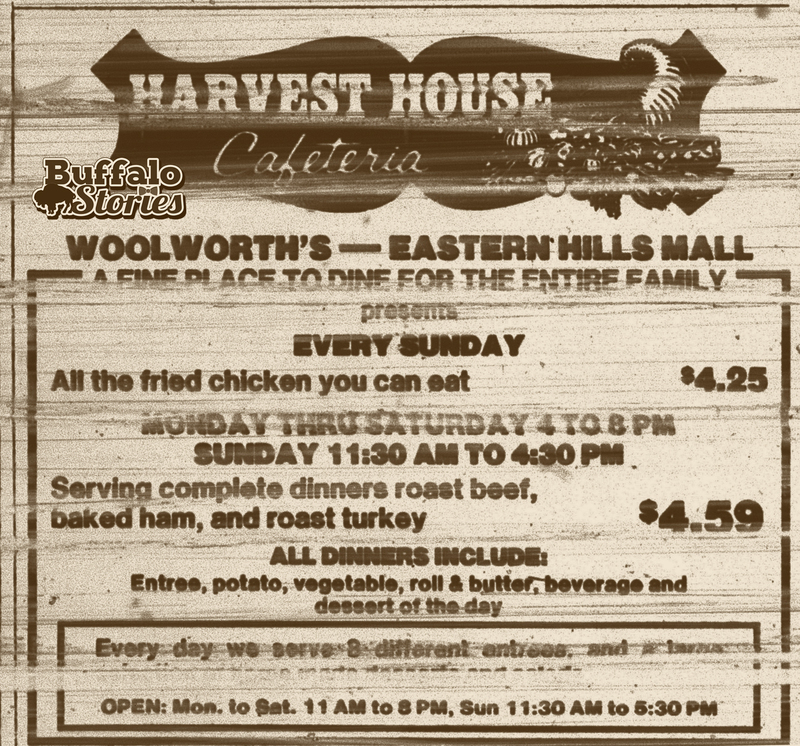 The Harvest House Cafeteria was inside Woolworth’s at the Eastern Hills Mall. Was it your family’s alternative to the York Steak House there? Ja-Fa-Fa Hots spent 60 years on Harlem Road at the 33 Expressway in Cheektowaga. 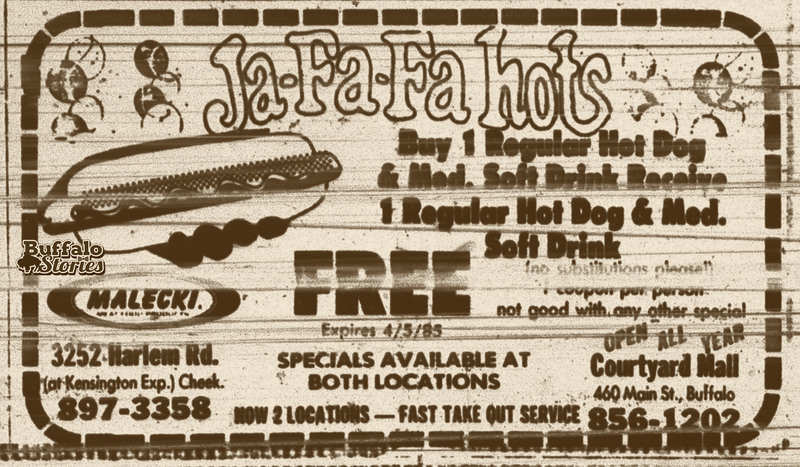 Ja-Fa-Fa served up Malecki hotdogs 30 years ago. Kids loved to help make their parents’ coffee at Lum’s, which featured cream poured from cow-shaped dispensers. Both the Canterbury and the Cloister were probably more for adults than kids, but they were certainly special-event restaurants for many families. Grandma’s Pancakes had two locations, one in West Seneca in the current Pasquales’s location, the other in the former Gleason’s on Main Street– across from what is now the Buffalo Medical Campus. Peanut shells on the floor. What else do you need to say about the seven area Ground Round locations? There is buzz and tempered excitement over the purchase the old AM&A’s department store building on Main Street. The building was last occupied in 1998 by Taylor’s, a short-lived high-end department store better remembered for its dress code (no sneakers!) than its offerings. In 1995, Bon-Ton closed what was the flagship store of the Adam, Meldrum, and Anderson Department Store chain. Bon-Ton bought AM&A’s in 1994. The building is now best known as the AM&A’s building, as it was from 1960-94. For the 90 years previous, AM&A’s was directly across Main Street from that location, in a series of storefronts which were torn down to make way for the Main Place Mall. 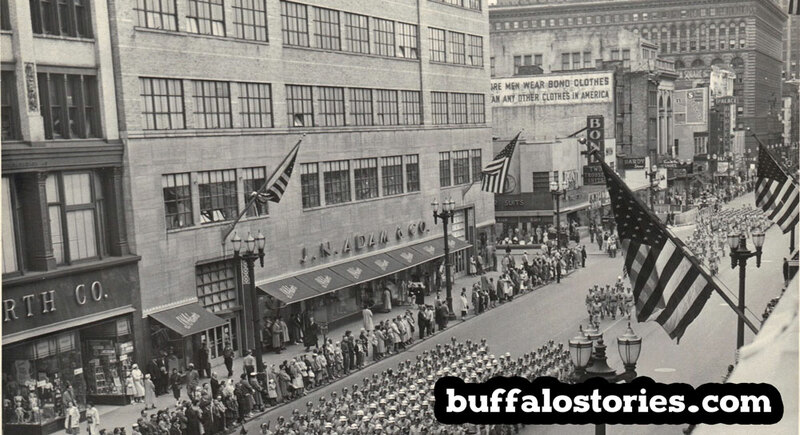 For most of the 20th century, the building we call AM&A’s was the JN Adam Department store. Adam was a mayor of Buffalo and the brother of AM&A’s co-founder Robert Adam. 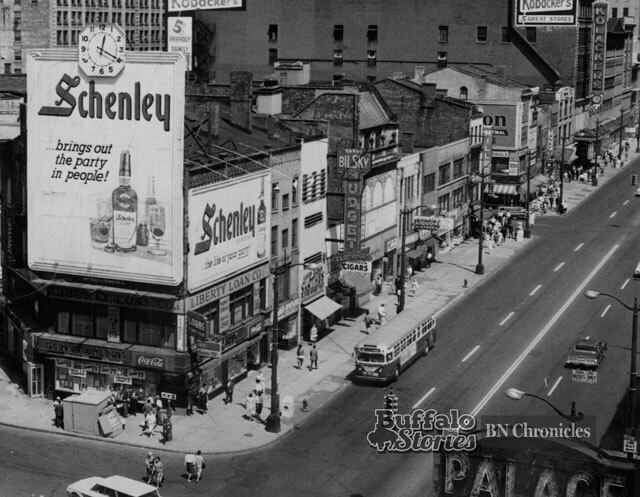 In 1960, JN’s closed, and AM&A’s took over the building. 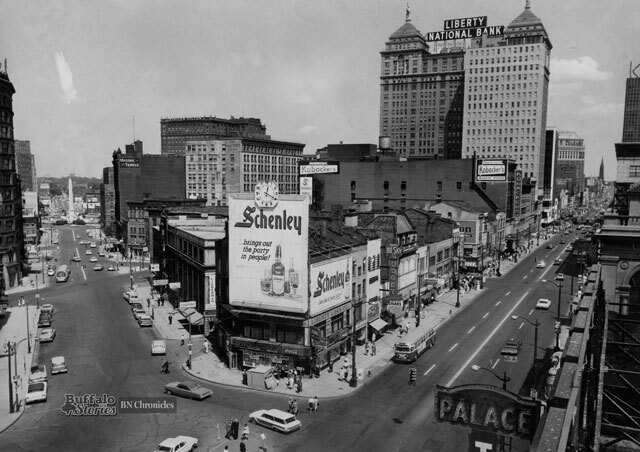 This photo, probably from the very late 1950s, shows Woolworth’s (which remained in that location until the chain dissolved in 1997), JN Adam, Bonds Men’s store (famous for two trouser suits), Tom McAn Shoes, the Palace Burlesk at its original Shelton Square location, then the Ellicott Square Building. All of the storefronts between JN Adam and the Ellicott Square building were torn down for the M&T headquarters building and some green space.